Mid century designer Wayne Husted's "Shotglass" Stoppered Decanter, designed for Blenko in 1960 during Husted's. Color: Blenko Tangerine, a popular orange/yellow gradation. Stopper: , 6-3/4" long, "shot glass style; micro abrasions. 11-1/2" tall long-necked body capped in a flattened 1-3/8" collar. A little cloudiness on bottom. Condition: No label (Blenko used a foiled hand as a label). 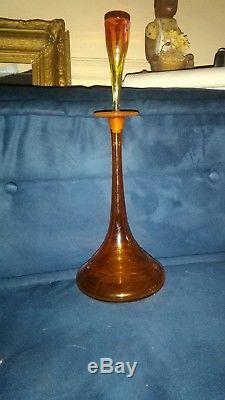 The item "BLENKO Shot Glass Tangerine Decanter Wayne Husted Mid Century Modern as is" is in sale since Wednesday, August 1, 2018. This item is in the category "Pottery & Glass\Glass\Art Glass\North American\Blenko". The seller is "goodfind49" and is located in Magalia, California. This item can be shipped to United States, Canada, United Kingdom, Denmark, Romania, Slovakia, Bulgaria, Czech republic, Finland, Hungary, Latvia, Lithuania, Malta, Estonia, Australia, Greece, Portugal, Cyprus, Slovenia, Japan, China, Sweden, South Korea, Indonesia, Taiwan, South africa, Thailand, Belgium, France, Hong Kong, Ireland, Netherlands, Poland, Spain, Italy, Germany, Austria, Israel, Mexico, New Zealand, Philippines, Singapore, Switzerland, Norway, Saudi arabia, Ukraine, United arab emirates, Qatar, Kuwait, Bahrain, Croatia, Malaysia, Brazil, Chile, Colombia, Costa rica, Dominican republic, Panama, Trinidad and tobago, Guatemala, El salvador, Honduras, Jamaica, Antigua and barbuda, Aruba, Belize, Dominica, Grenada, Saint kitts and nevis, Saint lucia, Montserrat, Turks and caicos islands, Barbados, Bangladesh, Bermuda, Brunei darussalam, Bolivia, Ecuador, Egypt, French guiana, Guernsey, Gibraltar, Guadeloupe, Iceland, Jersey, Jordan, Cambodia, Cayman islands, Liechtenstein, Sri lanka, Luxembourg, Monaco, Macao, Martinique, Maldives, Nicaragua, Oman, Peru, Pakistan, Paraguay, Reunion.